Oddly enough, Mega Man, gaming legend though he is, never received a comic book adaptation in North America. Sure, he was a prominent character in the cult series Captain N: The Game Master (with two episodes being loosely based on Mega Man 1 and 3) and had a goofy but relatively decent cartoon series (barring a couple of infamously bad episodes) that lasted two seasons, but never a comic book. Not until 2004 at least, when the license was acquired by Dreamwave Productions. Dreamwave was a company formed in 1994 as an imprint of Image Comics, producing a few original titles but getting their first big hit in 2001 with their Transformers comics series, which topped sales charts and met with great acclaim from fans. In 2002 they split from Image to become an independent company, acquiring licenses to several popular franchises at the time including Duel Masters, Devil May Cry, TMNT and Mega Man. In 2004, Dreamwave's head writers left the company over pay disputes and the studio shut down shortly thereafter in early 2005, resulting in the cancellation of several of their licensed comics before their storylines were concluded. Of course, being the huge Mega Man nut I am, I naturally had to check out this comic. The individual issues are now quite rare and expensive, but I did manage to find a "pocket size" trade collection containing all four issues for only $10. If you're looking to track down a copy for yourself, that's definitely the best way to go. Of course, it's not a question of whether you can find this comic as whether you should; is it ultimately something you'd want to read? Well, let's take a look inside and find out. 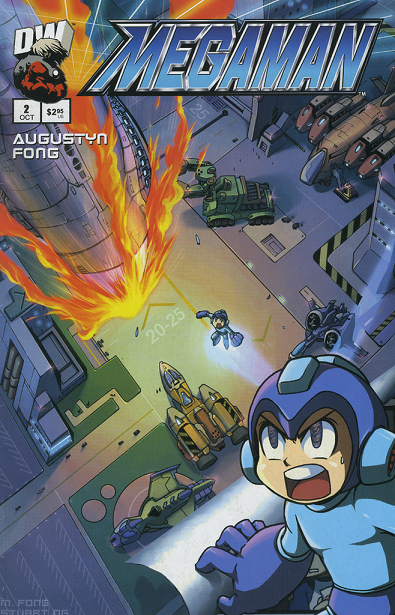 The cover of the first issue definitely captures the vibe of the game boxes, with Mega Man nearly flying off the cover as several enemy robots attack him from the background. The problem is that it's somewhat misleading - none of the enemy robot masters depicted on this cover appear in this issue, or indeed any issue of the series. Mega Man also has extremely oversized limbs, but that seems to be a common thing in promo art of him too so I guess it's excusable here. We open in "Mega City", formerly known as "Monstropolis" - a cute little reference to the Mega Man 1 manual and well... already, we can see them setting up the main problem with this comic. 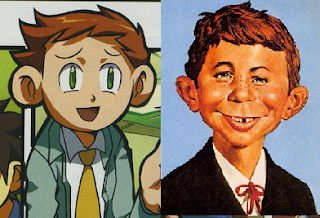 Yes, Dr. Light has enrolled Mega Man in junior high, his given explanation being that it will help his Independent Determination programming evolve and make him more humanlike, or something. If you think this is a weak setup to put the story in a situation they can easily hammer formulaic story elements and cliched characters out of, you're pretty much correct. But we'll give that fact the criticism it deserves when we actually get to that part of the story. They get caught in a traffic jam, which Dr. Light states can't happen because of his fail-safe "Light Perfected Traffic Control System(TM)". Mega Man quickly spots the problem: A green Transformer-looking robot is running around smashing his traffic signals. Mega Man springs into action to stop it, transforming into his armor via a wristwatch and then blasting out of the sunroof of the car via his... rocket boots? What? 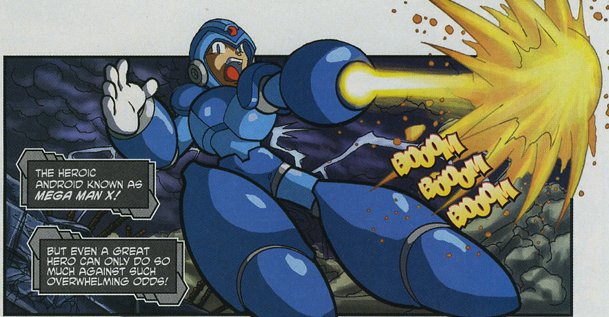 There's another oddity about this comic - the sudden addition of Mega Man's rocket boots. Mega Man never had rocket boots in his games. Mega Man X could air-dash and hover briefly via his leg upgrades (and gained temporary flight in X5 via the Falcon Armor), but in the original series Mega Man always had to use Rush to fly around. ...As a matter of fact, where is Rush? He's on the cover and even the letters page, but nowhere to be seen in the story itself! Anyway, Mega Man engages the hostile robot, monologuing about how the onlookers wouldn't be cheering for him if they knew he was a robot or some crap. Even the writer seemed to thing this dialog was hokey, though, as his very next line is "Oh well, time for teen angst later" and lands a charged shot on the robot's head. This sends it into Lost in Space mode as it begins to loudly announce its system functions and primary objectives whilst returning fire at Mega Man. Oh, and its name is "Barrage Man", apparently. The fight is over relatively quickly as Mega Man lands atop one of Dr. Light's traffic signal thingies to save himself from freefall, then unloads a haymaker and a salvo of energy blasts on Barrage Man to finish him off. 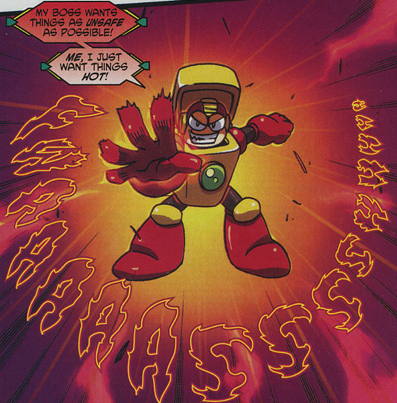 Sadly, he does not get equipped with Barrage Bomb (in fact, he never once uses the Weapon Copy system - another staple of the Mega Man franchise - throughout the entire run of the comic!). Nor is Barrage Man's appearance given any further attention as the next panel just has Mega Man being dropped off at school. Dag, Dez and Dix, the "Boltz Brothers". Your generic motivation-less bullies for the next three and a half issues of reading. They antagonize Mega Man for a bit before the fight gets broken up by Krupke, a hall monitor robot or something who looks like a 1920s candlestick telephone. Also, his name is a reference to West Side Story. Also also, he tells them to move along before he can "site" them. I guess the editor wasn't paying attention that day. Rock's day continues with him being repeatedly antagonized by the three during his classes. During lunch break he meets a friendly kid named Alan who explains that they've been held back multiple times and pretty much just stick around to antagonize their classmates, because apparently expulsion doesn't exist in this universe. The Boltzes, up to their tricks yet again, sabotage the lunch lady robot's mashed potato dispenser machine (yes, they have those in the future too) to fire crap everywhere. But hero that he is, Mega Man saves the day by tossing a coke bottle into the spigot, causing it to explode and coat the Boltzes in liquefied spud. Remarkably this still doesn't get them expelled or even earn them a slap on the wrist, since they're right back to their usual nonsense two pages later. ...Come to think of it, I haven't seen a single adult at this school anywhere; all of the faculty just seems to be primitive-looking robots that would look right at home in an episode of the Jetsons. That's just asking for trouble right there. This doesn't really go anywhere as Chelsea just chews them out for their actions and tells them to get lost, which they do with surprisingly little resistance. Auto then shows up to give Mega Man a ride, revealing to the gathered crowd that he is related to Dr. Light - a pretty big deal since he's apparently designed every single computerized system that this futuristic city runs. 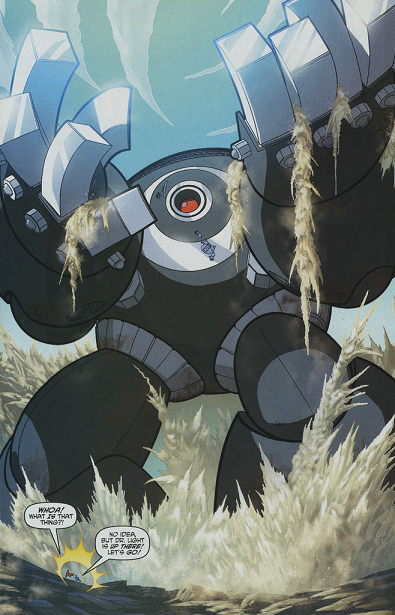 On the way back another emergency crops up with Dr. Light's "Light Automatic Traffic Speed Governor(TM)*" malfunctioning, causing a chase between the robotic police force and a bank robber to quickly get out of hand and approach dangerous speeds. Apparently this is once again a job for Mega Man as he leaps into action to apprehend the robber. 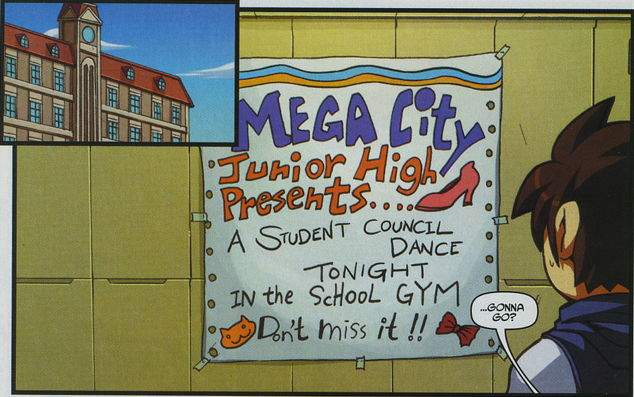 *I'm not being facetious here; they actually put a trademark symbol in the text balloon. They did it with the traffic signals from earlier in the comic too. 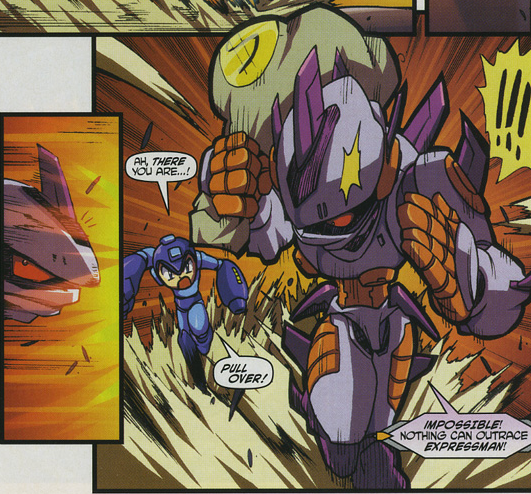 We can also add "super speed" to Mega Man's repertoire for this comic as he catches up to the robber, another robot with a conspicuously out-of-place design named Express Man. On to issue two, which features a significantly worse cover than the first. There's a tiny Mega Man flying over what appears to be a Y-Wing from Star Wars and a green tank robot setting fire to a space shuttle. There's also a much larger Mega Man peeling back the cover of the page while a tiny jet crashes into his head. It's all very confusing and kind of cluttered. We open to the Mega City Aerodrome, the world's busiest airport being run by yet another Dr. Light invention, the Light Perfected Air-Traffic Control System, No Trademark This Time. Of course, it's not long before trouble strikes again here and... hey, we finally get a familiar face among our robotic antagonists. 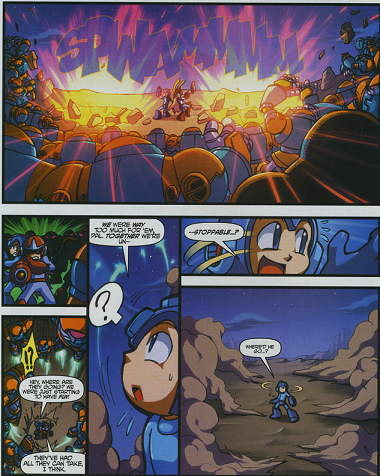 At first, I'd thought that maybe this comic was supposed to be a prequel to the first game and the previous two robots were just some of Wily's early designs or something, but the arrival of Mega Man 2's Heat Man just crushed that theory. So instead, I offer a new theory: Dreamwave's Mega Man plays by its own rules. Its own bizarre, nonsensical rules. Anywho, Heat Man annihilates the robotic air traffic controllers, causing a midair collision with one plane losing a wing. Mega Man arrives on the scene accompanied by the previously-absent Rush and they fly into action, using a highly pressurized hose of "Crash Foam" to level off the damaged plane so it can land safely. Yeah, crash foam. Portable cushioning for use on airplanes. Which is carried around in tanker trucks that couldn't possibly keep up with a nosediving plane. Just... go with it. 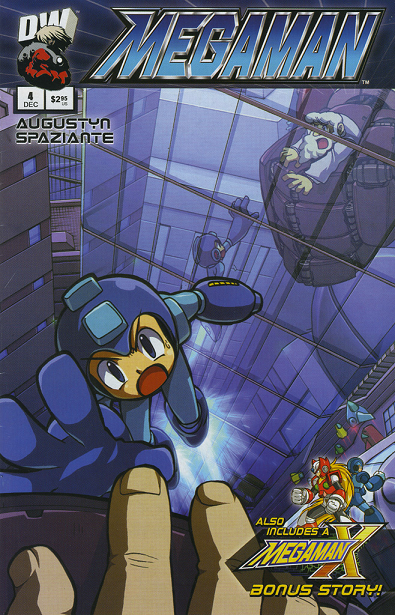 I also just noticed that Rush was on the cover of the previous issue but conspicuously absent from the issue itself, while this issue is the total opposite - Mega Man's flying around with his jet boots on the cover, but in the story he uses Rush for flight. It's a headache of a continuity error, that one. At any rate, as he's saving the plane with a crash foam hose a swarm of Mets fall out of the sky and attack him. Yes, Mets. The little hard hat guys. Where did they come from? 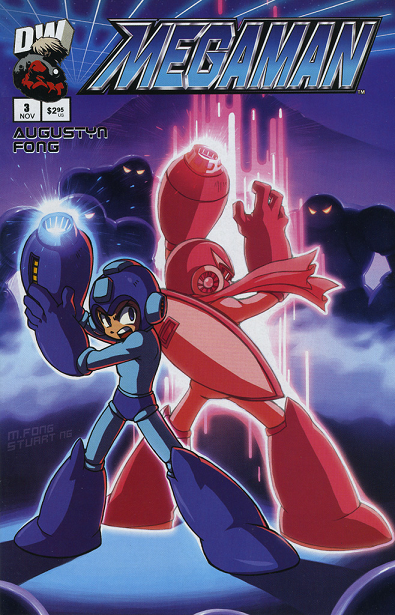 Why are they falling directly toward a position they had no way of knowing Mega Man would be at? Why doesn't Mega Man just ignore them seeing as how they can't fly but he can? Never explained! But Mega Man does manage to stop them and save all the passengers on board the plane at the same time, so I guess it's all just as well. Well, that's the end of that scene. ...No really, that's it. 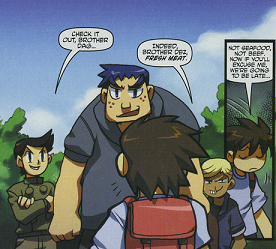 He doesn't even fight Heat Man or anything, it just cuts to the next day where he's at school, talking to Alan about how that cool Mega Man guy saved a jet from crashing. That marks yet another goofy thing for our list - nobody recognizes Mega Man when he's out of his armor despite the fact that his armor in no way covers his face! No, your eyes do not deceive you. Dix Boltz (that name in itself being unintentional comedy gold) tears a pull-up bar off of its mounts, twirls it above his head like Ray Park, then smashes Mega Man with it. Then the fight gets broken up by their uncle, who is none other than... 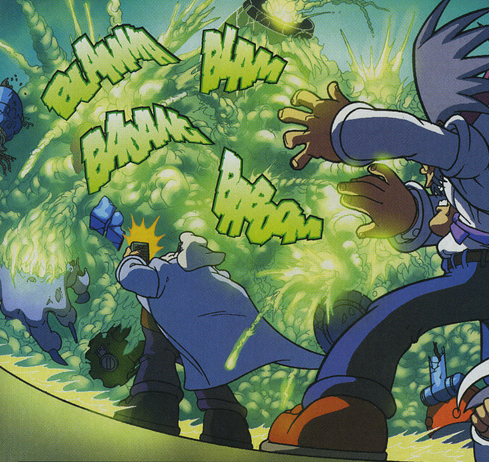 Doctor Wily. I fully understand if you need a moment to recover. Dr. Light picks up Mega Man from school and they have a discussion about Mega Man's dual nature as a robot with the mind and heart of a human. 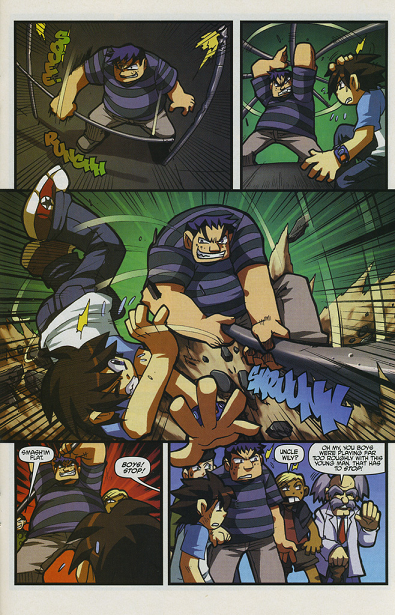 It's honestly not a bad scene, but it is a fairly jarring thing to cut to when we've just come from a page where Mega Man gets clobbered by a fat kid wielding a pull-up bar. 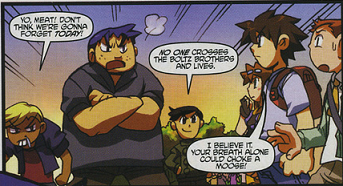 Which he for some reason never mentions to Dr. Light. That's obviously a hint at Protoman's introduction later on. The comic didn't last long enough to establish exactly who he was, though. As they reach home and step out of the car, another robot goes on the attack, a giant spherical robot who introduces himself as Multi Man. Cue more dumb dialogue! Multi Man reveals his power - the ability to spawn smaller clones of himself, who in turn spawn smaller clones of themselves, and so on and so forth. It's a gag from a Samurai Pizza Cats episode played completely straight. 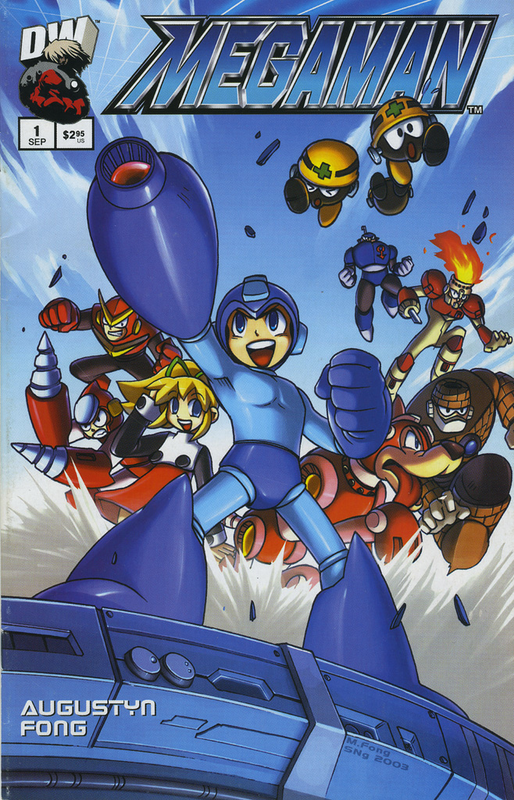 Mega Man is quickly overwhelmed by their sheer numbers, ending issue two with him being captured and the small army of Multi Men blasting off into the sky, Mega Man captive inside their leader's body. Our third cover looks pretty good, depicting Mega Man and the not-yet-properly-introduced Protoman fighting off an army of shadowed robots. 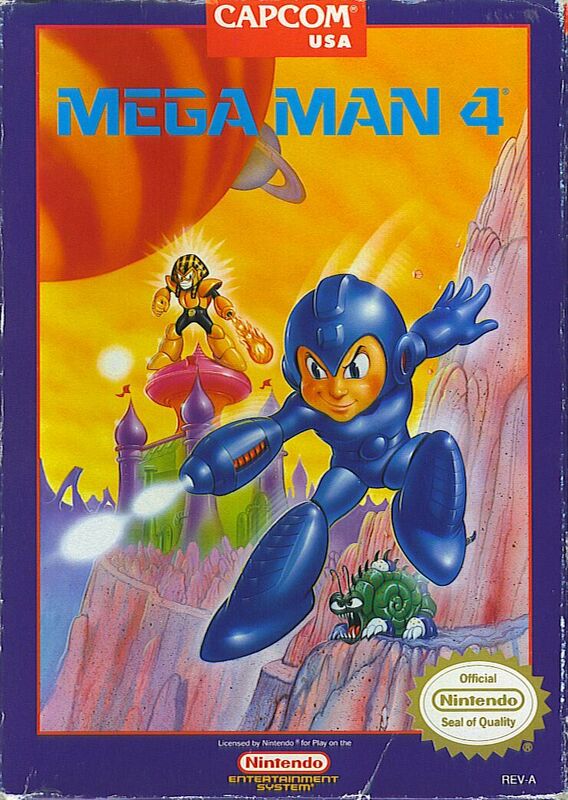 Gotta love that cheesy hand-drawn 3D grid at the top too; perhaps a small throwback to Mega Man 4's weapon screen or the original Mega Man box art? We pick up right where the previous issue left off as the narrator espouses corny dialog about Multi Man's powers and his capture of Mega Man. But that doesn't last long as Mega Man figures out his prison isn't particularly durable and blasts Multi Man's stomach hatch open, freeing himself. Mega Man once again gets picked up by Dr. Light - in a helicopter this time, no less - as he gushes over how cool Protoman was. Doc again avoids giving any specific answers about Protoman and just tells Mega Man that it's a school day tomorrow. Cue awkward segway! I'll forgive them if they start playing "I've had the Time of my Life"
The next part is a little hard to follow, but what I gather happening is this: The lights go out momentarily, and when they come back on the DJ robot goes outright mental, blasting ear-splittingly loud music that leaves all in attendance in agonizing pain. Mega Man quickly ducks out of the room to change into his armor, jets through the air and gets into a fight with DJ Bot, kicking him across the room and then shorting him out with a power cable. This is a supremely silly way to interject a villain into this scenario, since he wasn't even working for Dr. Wily or anything. 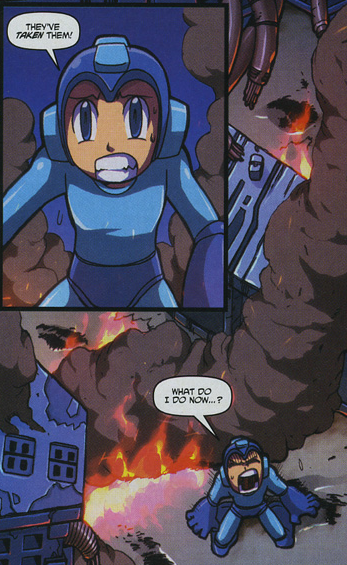 For all we know he just had a glitch in his volume control and Mega Man casually murders him for it. He steps off the stage to a hero's welcome by the kids in attendance, with Chelsea and Alan remarking that Rock will be totally impressed by all this. At the mention of that Mega Man teleports out, coming back in a moment later in his civilian guise. Despite the fact that he was in front of them with face-exposing armor on not ten seconds ago, they still don't realize that Rock and Mega Man are one and the same. I guess the police or some concerned parents or something arrive not long thereafter since the scene cuts away to Mega Man walking home, loudly expositing to the empty streets about how fitting in among humans might not be so bad after all. He sees a fire in the distance at Dr. Light's lab and rushes to the rescue just in time to see Heat Man and two goon robots loading up some cargo and then blasting away from the scene in a shuttle. Our fourth issue ends on a rather grim scene as Mega Man stands alone in the burning lab shouting to the heavens. Another pretty neat cover, this time depicting a scene viewed through Dr. Light's eyes as Mega Man rockets to his rescue. We've also changed artists for this issue from Mic Fong to Patrick Spaziante. Yes, the same Patrick Spaziante who would later provide the artwork for the first few issues and several covers of Archie's Mega Man series. How ironic. 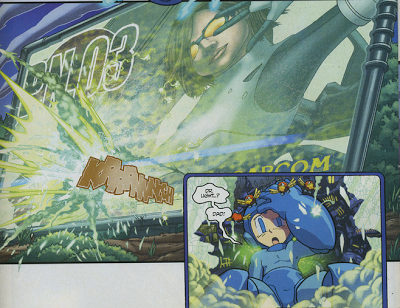 Mega Man continues to assess the damage, spotting Protoman outside hiding behind a tree. 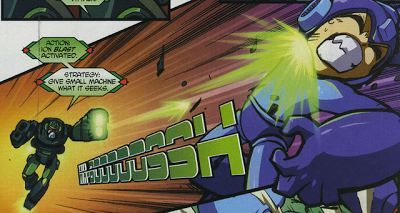 Mega Man flies after him with his jet boots (I guess he did still have them) and they have a chase scene, ending with Mega Man crashing into some product placement with a very neon-colored splash. Protoman gloats about how that should teach him not to jump to conclusions, which only further infuriates Mega Man and they get into a shouting (and shooting) match. Thankfully this doesn't eat up the majority of the issue as these things tend to do in comics; Protoman calms Mega Man down pretty quickly and explains that he doesn't know who's behind the attack either, with both of them agreeing to cooperate to find Dr. Light. We cut to "Dr. Wily Robotics", where Dr. Light is arriving in his own shuttle. We also get a barrage of cameos in the form of a Guts Man shaped gate, a Cloud Man hologram and Cut Man and Magnet Man in tubes, as well as a taste of Spaz's art at its silliest. Now don't get me wrong here: Patrick Spaziante is an extremely talented artist and has done a lot of great work, evident even in the early pages of this issue - the opening scene of Mega Man in the burning lab and his brief tangle with Protoman look absolutely fantastic. It's just that for every handful of good, well-proportioned pages he does, he also churns out some pages that look downright goofy, with huge mouths, chins and teeth and absolutely massive sideburns and facial hair. There's certainly a time and a place for wildly exaggerated features, but it's not when two people are just sitting at a desk talking to one another. They go back and forth about how Dr. Light knows that Wily is the one sabotaging his technology because he is the only one who would know how because they were former partners. 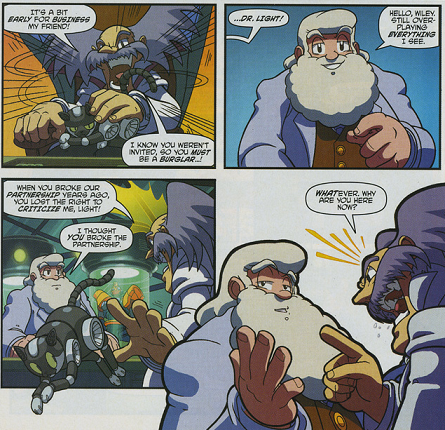 Wily just fires back that he got tired of living in Dr. Light's shadow and sics several skull-shaped robots on Dr. Light, ordering them to kill him. Yeowza. I know he was selfish and kinda nutty in the games, but this just seems a bit much. In any case, it doesn't take much for Dr. Light to turn the situation around, causing all the skull robots to explode into Ecto Cooler with just the press of a button on his remote control. One of Crytek's developers stumbled upon a copy of this issue and immediately fell in love. "I MUST make an entire game of nothing but bright neon colors and things exploding! ", he thought aloud. Thus began the tale of Far Cry 3: Blood Dragon. Dr. Light also informs him that his magic remote control has notified the police and that they're already on the way. Wily isn't ready to admit defeat just yet, though, and smashes his fist into a control panel that will presumably unleash hell. We don't get to see exactly what it does just yet though as we cut back to Mega Man and Protoman, who have just arrived at the gate to Dr. Wily's factory. As they enter, they're immediately set upon by a robot resembling a metallic version of the Yellow Devil. It just seems to ignore them completely and instead heads off toward Mega City. 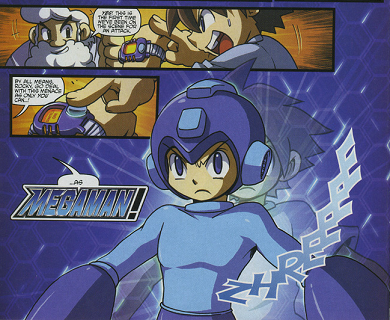 Their attempts to stop it through force prove about as fruitless as you'd expect, so they agree to split up, with Mega Man going to rescue Dr. Light and Protoman attempting to find a way to sabotage its power system. It actually doesn't lend itself to as much decent action as you'd think; Mega Man just crashes in through the window and flies off with Dr. Light in tow while Protoman (I think) flies inside and fires at its core reactor, resulting in a massive fireball. It appears that Protoman somehow got out of there before it blew as he's seen on a hilltop some distance away. We also see that Roll, Rush and Auto are all perfectly okay, having been passengers on Light's shuttle. Dr. Light promises that they'll find a new place and that he'll explain exactly what's going on at a later time; and so our story ends. But we're not quite done yet. This issue was also intended to be the launchpad for a Mega Man X comic by Dreamwave, which never got off the ground thanks the company's looming bankruptcy. But at least we can enjoy the pilot of it that this issue has to offer. Through a combination of distorted perspective, exaggerated anatomy and a facial expression that looks downright ridiculous, Mega Man X somehow manages to look almost as bad as the infamous Mega Man 1 box art. 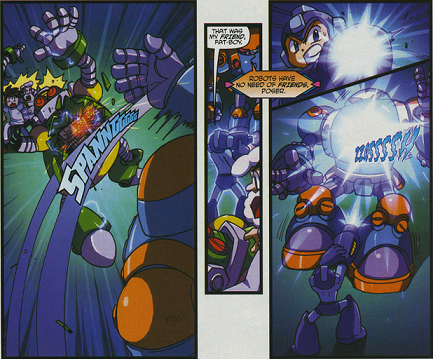 X is quickly overwhelmed by Vile's forces, but luckily for him, Zero comes into save his bacon, slicing apart both Soldier Stonekong's arm and Vile's mech in a matter of moments. Through more bad dialog, it's exposited that Sigma's forces are overwhelming their own and that they're going to need help if they want to come out ahead in this fight. They mention having spoken to "the doctor" and that they've come to a conclusion - that one of them has to go and get help before it's too late. Zero hands X a small round object that begins glowing and promises to hold the fort against the onslaught of Mavericks until he gets back. Cut to original Mega Man era Mega City where Dr. Light is just putting the finishing touches on Eddie/Flip Top, who is apparently a coffee dispenser in this universe. You know, just like he isn't in the games. A bright flash appears outside, prompting them to investigate. Surprise, it's X, who has traveled into the past to seek Dr. Light's help! To be continued in Mega Man X #1, which never came to be because Dreamwave went bust shortly after this issue was printed. 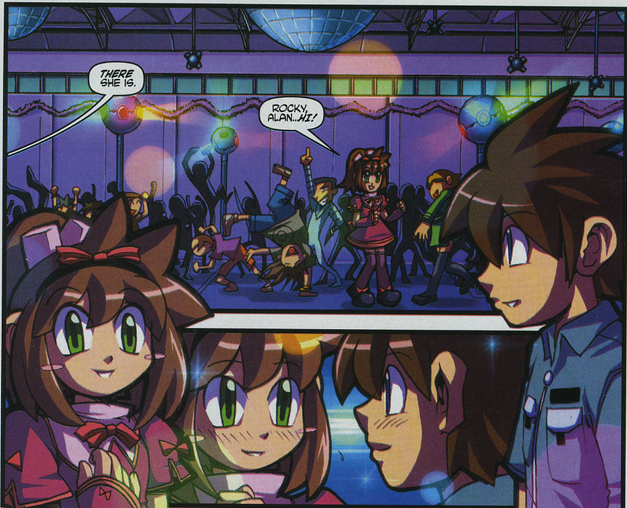 So that's the Dreamwave Mega Man comic. How does it fare? ...Well, I don't want to call it "bad" because there are several other video game adaptations that are far more worthy of that moniker (naming no names ...), but it's not very good either. The overall premise is silly, there's not much emphasis on action for a comic based on an action game, and a lot of the dialog is laughably corny. It certainly may have picked up had it continued further, but as it stands it's a mostly dumb comic with a few clever moments and some pretty decent artwork. If you're not a die-hard Mega Man fan, you can safely give it a pass.